E-Cig Review Site wants to ensure that you get the best vaping experience which fundamentally means guiding you to the best e liquid in 2018 and the best vape pen combination for your needs. E-liquid, also known as vape juice or e-juice is the fuel for vaping and so it is important to understand what you are vaping. Our aim is to inform you of the facts surrounding vaping in an endeavour to assist you to the transition from smoking to vaping – simply and without hassle. E liquid is probably the most important aspect of safe vaping so we have dedicated a lot of space on the site for information and reviews on getting you the best eliquids in the UK. When choosing your e-liquid to use with your vape pen or e cigarette make sure it is of the best e liquid quality available, ensure the manufacturer uses proper laboratories to mix the e-liquid. Some UK e-liquid shops and stores mix eliquids for you in non controlled environments – this is not a good idea! Ensure you have a full understanding of the ingredients contained within your e-liquid and that your e-liquid is batch tested so that there is accountability. Go for the best organic e-liquid that is tested pure. The best tobacco e-liquid flavour will help in any transition from smoking to vaping. Clearly labelled ingredients and e-liquid content on packaging is a better way to ensure you are starting out right! Use our electronic cigarette reviews section to find your perfect e-cigarette. A vital part of your e-cig is the e-liquid that it uses, but what exactly is it, what do they normally contain, and how do you know what is the right one for you. In this e liquid review article we will aim to guide you through any queries and concerns you may have regarding the use of eliquids. E-liquid is the term used to describe the liquid content that is used in conjunction with your electronic cigarette, there are other terms that are also used, such as e-juice, Vape-liquid, smoke-juice, or simply “Juice”. So what does e-juice contain? Contents of the e-liquid solutions vary from manufacturer to manufacturer, but their common aspects include water and flavourings in a propylene glycol (PG) or vegetable glycerine (VG) base. PG or VG liquid is used as the carrier to provide the nicotine to the user; however users also can use electronic cigarettes with zero nicotine content e-liquid. The base fluids produce the “smoke” visible when used with an appropriate electronic cigarette device. Each of the bases has a different characteristic which will mean that some will appeal to some users more than others. The diagram below is a quick visual outline to the characteristics of each of the two main types of base. As you can see the PG tends to be more popular with users as it has an increased flavour density, and a bigger “throat hit” than VG e liquid, but it also has a higher risk of an allergy. Many liquids use a mix of these two base types to optimise user satisfaction, the mix, or blend, is usually clearly advertised on the selling page of the e-liquid provider. For Shisha Stick users zero nicotine strength e-juices with various fruit or sweet flavours are used in the e-shisha pen. Both the liquid bases are common food additives used in a variety of pharmaceutical formulations. Propylene glycol, the current most popular liquid base, has been utilised in asthma inhalers and nebulizers since the 1950’s, and because of its water-retaining properties, is the compound of choice for delivering atomised medication. There are simply hundreds, if not thousands of different e liquid flavour varieties available, with new ones appearing almost daily, this includes a wide variety of food flavours, from the traditional (vanilla, coffee, and chocolate) to the more exotic (strawberry, watermelon, mango). There are also e-liquid flavours on the market that aim to mimic specific cigarette brands, such as Lambert and Butler, Marlboro or Camel. All flavours are subjective however, and each person will have a subjective experience of the taste. Generally tobacco flavours or those that aim to mimic tobacco brands are still a stretch away from having the same flavour as a traditional tobacco cigarette brand, but still effectively offer the user a similar flavour that as well as being reasonably compatible, also offers the simulation of a great throat hit and clouds of vapour plumes whilst simultaneously delivering the desired nicotine to the user. Liquid solutions containing nicotine are available in differing nicotine concentrations to suit user preference. Although there is no strict legislation regarding how much nicotine qualifies for the dosages given, most better e cigarette manufactures work to the standard outlined below. No nicotine – eg shisha e juice – it is reckoned by some that most of the addiction of cigarettes is a psychological one – a comfort-act of bringing your hand towards your face. If this is right, maybe we don’t need the nicotine. Although many e-cig users are a bit sceptical of this claim as they have tried zero nicotine and found it doesn’t work for them. They report that there is no throat hit. Many concede it is worth a try, and pleasant, but not really a smoking alternative. Low (about 6 Mg or 0.6% nicotine). This just means that you get 6 Mg of nicotine per Ml, so a total of 60 Mg of nicotine in a 10 Ml bottle. Given 200 drops per bottle, you would get about 0.3 Mg per drop – equivalent to a super-low cigarette like Silk Cut Blue. If this is the kind of cigarette you smoke, then a ‘low’ strength liquid is right for you. Low-Medium (about 11Mg). Here you get 11Mg x 10Ml in a bottle – 110Mg, divided by 200 drops equals about 0.5 Mg – equivalent to an ultra-low cigarette like B & H ultra-light. Regular (about 16 Mg) – if you smoke a cigarette with an indication of 0.8 mg, this means a total of 16 mg (20 cigarettes x 0.8) – A ‘light’ cigarette is usually about this strength. So from a bottle, you get 16 Mg x 10 Ml bottle = 160 Mg, divided by 200 drops = 0.8 Mg – the equivalent of a Marlboro Light. High (24 Mg) – about 1.2 Mg per drop – equivalent to Mayfair, B&H Superking, or a full-strength Marlboro. Super High (36Mg) – 1.8Mg – I am unsure which brands are this strong, but take a look on the packet – if it says it has 1.8 Mg of nicotine, then you may want to try the super-high. Actual numerical nicotine concentration ratings are usually printed on liquid containers or cartridge packaging. Often the standard notation “mg/ml” is shortened to a simple “mg”. Generally the higher the nicotine content, the stronger the throat hit, which is the sensation the user experiences at the back of the throat upon inhalation from their electronic cigarette device. Best advice is – start low and go higher if need be. See our “cigarette to e-liquid flavour match” chart for common UK cigarette brands. Questions have also been raised over the standard practices of e-liquid and electronic cigarette manufacturing and the lack of regulations that surround it. There are many articles and reports on e-liquid risks that you must be aware of. There is a distinct lack of best practice guidelines for the e cigarette and e-liquid industry. The two countries that are the main producers of e-liquid are China and the United States. In the United States manufacturers must adhere to guidelines put forth by the Federal Food Drug and Cosmetic Act though there are no other required certification processes to be obtained for production and distribution of e-liquid. The FDA is currently underwriting e-cigarette regulation for the manufacturing and sale of e-liquid and electronic cigarettes. In China, manufacturers must obtain non-toxic testing permits to regulate the amount of pure nicotine that is mixed with e-liquid batches, but no other documentation is needed to produce and distribute. Some concern has been raised over the quality of ingredients used in Chinese manufacturing, but no substantiated evidence has been brought forward to discredit Chinese manufacturers. Many Chinese companies comply with standards implemented by the International Organization for Standardization (ISO). Some better e liquid manufacturers in China now have stringent hi-tech manufacturing plants with advanced quality control and also offer certifications of MSDS and TUV VOM in order to comply with a reputable standard of quality together with a standardised safety module of their products having undergone an array of tests covering their e-liquid contents. It must be said however that currently there is no strict legislation governing eliquids specifically, so you need to be vigilant. TPD regulations cover e cigarettes generally. So only use e-liquid that is lab tested and from a reputable source. Spend some time making sure you get the best vaping starter kit and best e-liquid to go with it. The NHS News site reports “…e-cigarettes are only covered by general product safety legislation… and we cannot be sure of their ingredients or how much nicotine they contain”. There are many research documents on-line that show the dangers of some e-liquids containing impurities that are not suitable for human consumption. A typical traditional tobacco cigarette will supply the user on average around say 10-15 inhalations; this would be termed as 15 puffs of inhalation in the e-cigarette world. So typically 15 puffs on an electronic cigarette device is approximately equivalent to one traditional tobacco cigarette in comparison. There are however many factors that would be taken into consideration to calculate the exact relative nicotine consumption. Some factors are: a) The nicotine strength of your e-liquid which may come in a range such as 9 mg, 12 mg, 18 mg and 24 mg; b) The e-liquid flavour base and c) The type of atomizer/cartomizer used and not to mention the actual amount of nicotine the body absorbs upon each puff. There are varying reports indicating what amount of nicotine the body actually absorbs, some studies claim only 10% of nicotine is actually absorbed by the body, whilst other reports claim, 50%, 60% and even 80%. Everyone smokes tobacco cigarettes differently in different circumstances. Have you ever really counted how many puffs it takes to finish a cigarette? How about when you’re driving? When you’re talking? When you’re drinking coffee? When you’re outside smoking? Electronic cigarettes don’t burn away. They only produce vapour at the user’s request. A tobacco cigarette depends on the situation. The nicotine density listed for e-liquid is the number of milligrams of nicotine per millilitre in the E-Liquid. A 2.4% mg/ml content of nicotine means a 10 ml bottle of 2.4% mg/ml nicotine e-liquid would have 24 mg of nicotine per millilitre which would be 240 mg of nicotine per 10 ml bottle (24 mg x 10 ml). Likewise, a 30 ml bottle of 2.4 mg/ml e-liquid would have 720 mg of nicotine in it (24 mg x 30 ml). When you refill your e-cartridges with e-liquid, you may want to know how much nicotine is contained in your refilling e-liquid. There are approximately 20 drops of e-liquid per millilitre. So using our 2.4% mg/ml nicotine e-liquid as an example, there would be 24mg of nicotine per ml (24 mg/20 drops). 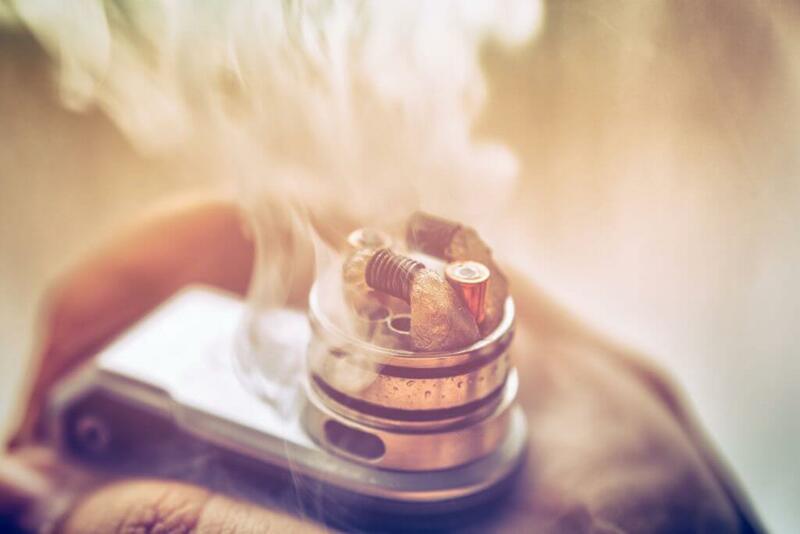 The amount as well as the feeling of the nicotine absorbed by the body from electronic cigarette smoking depends on many factors including the density of the nicotine in e-liquid, the electronic cigarette vape quantity, the smoking frequency and timing and the smoking inhaling respiration rate. See our Nicotine absorption article. Actually the nicotine in the E-Liquid cannot be absorbed completely by the vaper. For instance, if you inhale 1 ml of E-Liquid which contains 24 mg/ml of nicotine this does not mean that you absorb all the 24 mg/ml of nicotine. You may only absorb about 10-50% for example of the nicotine according to your personal smoking habit. As previously mentioned the actual nicotine absorbed by the body differs according to the current varying medical reports. The numbers have been rounded slightly here to make them easier to work with. No scientific studies that I can find have actually been performed with regular users of e-cigarettes to determine how much of the liquid nicotine, if any, is “burnt up” or vaporized before it hits the lungs. Therefore the numbers represented above indicate the maximum amount of nicotine intake assuming that 100% of it makes it into the lungs of the user of an electronic cigarette. See our “cigarette to e-liquid flavour match” chart for common UK cigarette brands. Alternatively you can simply calculate your approximate nicotine intake from the size of your atomizer cartridge or cartomizer. Is the nicotine in e liquid poisonous? It should also be noted that although nicotine is highly addictive, no studies have shown nicotine to be a carcinogen. It is simply “the fix” that cigarette smokers crave. It is recommended that those who have a demonstrated sensitivity to nicotine, are pregnant or breastfeeding or who have unstable heart conditions, should discuss the use of any nicotine delivery device with a doctor before using. Shisha pen vapers may not be concerned with nicotine but should ensure their e liquid is from a safe source with full disclosure of ALL ingredients. Doctors bring up some very good points about electronic cigarettes. While many do not endorse them, many certainly think electronic cigarettes are a good alternative from inhaling 4000+ chemicals in regular cigarettes. The BBC reported on an article, “E-cigarettes should be offered to smokers, say doctors”, that looked at a recent 200 page study done by the UK’s Royal College of Physicians that reiterates the earlier study by Public Health England. Both studies advise that there is resounding evidence that e-cigarettes are “much safer” than traditional smoking. Ensure you know what goes into your e-liquid.